Set the UI properties of an application. SDL requests to set-up the data for VR help layout, the name and icon for in-application menu and the properties of the touchscreen keyboard. The request may arrive for the application whether being active or in background on HMI (depends on Policy Table permissions applicable to mobile application request, by default allowed to operate in all HMI levels except of NONE). The vrHelp parameter of the SetGlobalProperties RPC is used by the system to display the help items on the screen and the helpPrompt parameter is used by the system for playing out the associated TTS help prompt. If at any point in time, the application sends SetGlobalProperties RPC with the vrHelp and helpPrompt parameters, then SDL Core shall continue with the existing behavior of forwarding such requests to HMI and SDL Core shall delete its internal list and stop sending SetGlobalProperties RPC to HMI after each AddCommmand/DeleteCommand request received from mobile. 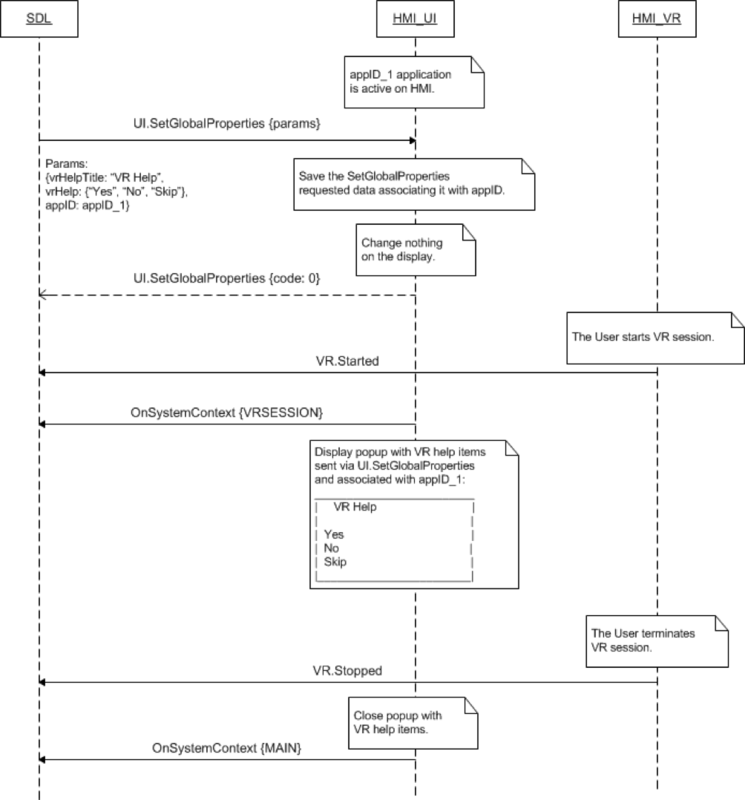 If at any point in time, the application sends SetGlobalProperties RPC with either of vrHelp or helpPrompt parameters, then SDL Core shall continue with the existing behavior of forwarding such requests to HMI and SDL Core shall not delete its internal list and shall continue to update the parameter which was not provided by the application. respond with <resultCode_received_from_HMI> to mobile app. transfer SetGlobalProperties with all requested parameters to HMI (thus, without autoCompleteList). respond with <resultCode_received_from _HMI> to mobile app. By default vrHelpTitle value is set to application name. The system shall have the ability to receive and store multiple strings for autoCompleteText per app. When the system receives a new list of strings for autoCompleteText for a particular app, the system shall delete the previous list and replace it with the new list for that app. When any of the keyboard layouts are being used, the system shall reference the list of autoCompleteText strings for that app. As the user enters data on the keyboard, the system shall display the autoCompleteText strings which match the entry. The number of matching autoCompleteText strings displayed shall only be limited by the character length constraints of the hmi. The system shall provide the user the ability to select one of the displayed matching autoCompleteText strings without having to enter the entire string. When the user selects one of the displayed matching autoCompleteText string, the system shall submit that entry and not require further user input for submission. Store the information and associate it with appID. Note: Initially, the appID together with other application-related information is provided by SDL within UpdateAppList or OnAppRegistered RPCs. display the list of commands available for voice recognition. SDL provides the title for this list (vrHelpTitle parameter) and the list of commands itself (vrHelp parameter which is an array of VrHelpItem‘s). display the in-application menu for every active application on User’s request. It must contain SDL-requested commands (UI.AddCommand) and sub menus (UI.AddSubMenu). SDL provides the values for the name (menuTitle parameter) and for the icon (menuIcon parameter) of this in-application menu. The values for in-application menu and touchscreen keyboard are allowed by SDL for navigation type of application only. display the onscreen keyboard upon User`s request within the following condition: all keyboardProperties supported by HMI must be embodied in HMI_capabilities.json file. In this case SDL are able to compare keyboardProperties requested by mobile device with actual supported keyboardProperties and send to HMI only that are supported. use default keyboardProperties – parameter in case SDL transfers UI.SetGlobalProperties request with omitted or empty keyboardProperties param to HMI. display the complete list of available VR commands (SDL-defined and HMI-defined ones) when the User activates VR. In case HMI does not respond SDL's request during SDL-default timeout (10 sec), SDL will return GENERIC_ERROR result code to the corresponding mobile app's request. Please see Result Enumeration for all SDL-supported codes.